More pictures of day 8 coming soon! Day eight of our tour of Morocco was our long drive day, traveling from Marrakesh to Fes. We took the highway instead of the scenic route that was initially planned, so that we could arrive with enough time to make it to the evening performance at the Sacred Music Festival. We got a early start out of Marrakesh, and we were all still tired from our exciting party the night before. Many of us slept on the bus, too tired after a intensive week of sight seeing to pay much attention to the passing scenery. I did notice that much of the journey looked similar to the Highway 101 drive between Los Angles and the bay-area, as far as landscape goes, though I was so exhausted perhaps I imagined that. We did a few stops a long the way for bathroom, water breaks, and lunch. One stop took us to a Shell station / mini-mart that was so Americanized in the items for sale, it hardly seemed like we were in Morocco anymore. 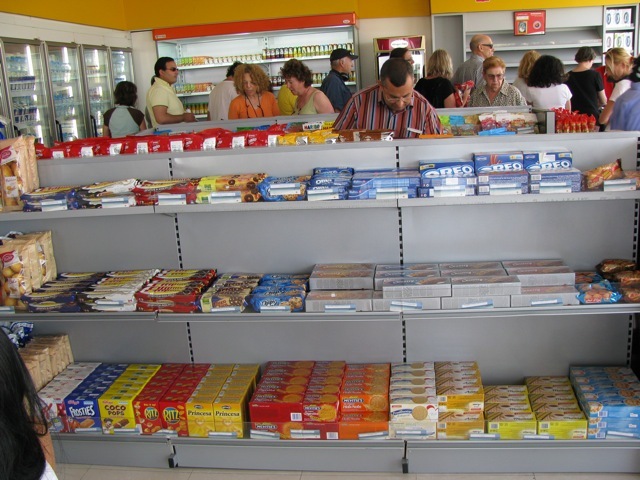 We all loaded up on familiar munchies at that stop. 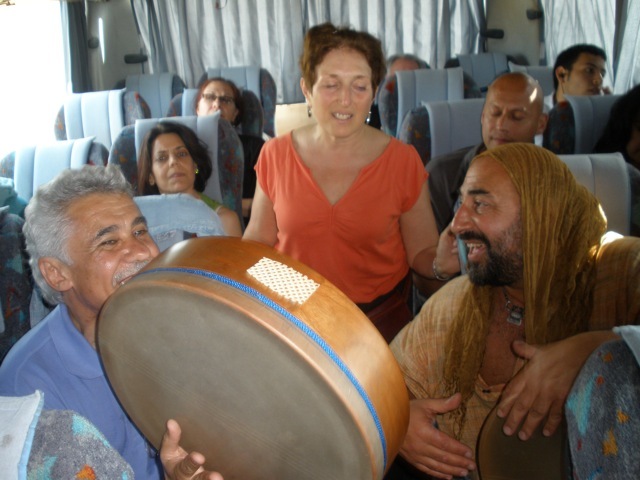 On our bus, Dror led many of us in the back of the bus in drumming, and singing, including some of the stuff he usually does at his “Idiot of the Village” workshops. 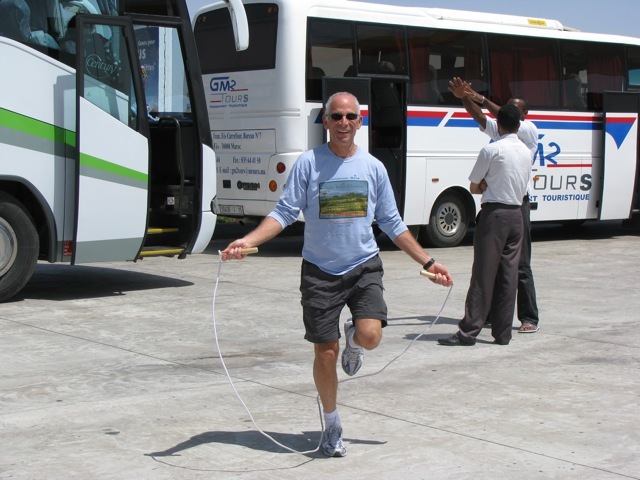 This was great fun, and helped us forget that we were spending more than 8 hours in the bus this day. Eventually we got to Fes, and to our hotel, the “Sidi Harazem”. This hotel is an amazing sight. It is old, and it certainly is showing it’s age. But, it has such exquisite architecture, and design features, that you can tell that, when it was new, it was definitely a majestic place. It is built on a hot-springs, and the pool is still filed with the spring water, a softer water than what you’d usually find in a swimming pool. It feels really nice to the touch. It also has wi-fi access, but only in the lobby, not in the restaurant, the bar, or the rooms. The internet connection was the fastest we had seen in Morocco, and I was even able to have a long video chat with the whole family back in Ben Lomond, without hardly any latency. I really didn’t like the hotel when we first got here, but, I need to say that, after a few days, it did grow on me, and I got over the fact that it was old and warn, and I started seeing that it contained such beautiful features such as the tile and stone work and wood carvings. This hotel has serious character, and you can feel it as you walk through it and around the hotel property. The only real downside to the hotel is the distance from the hotel to the Fes Medina, where the music festival is being held, and there is not much of interest near the hotel that can be accessed without bus or taxi. We ate dinner in the hotel, then re-boarded the bus to go to our first concert of the Sacred Music Festival, in the “Bab Makina” performance space. As we got near to the venue, it was dark out, and we got our first close-up look at the old section of Fes. Fes is an awesomely complex city, with beautiful walls of white surrounding the old part of the city. In fact, almost all buildings that you see in Fes are white or off-white, and it takes on a kind of spiritual look to it, perfect for the Sacred Music Festival. We got to the Bab Makina, purchased or tickets, and entered the venue. Oh man, what a cool place to see a concert. 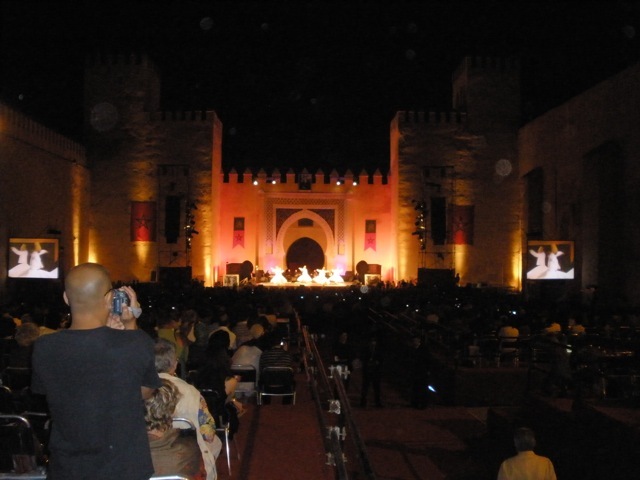 As you can see in the pictures, it is a large outdoor performance space, with towering castle-like walls of white surrounding the large courtyard where the performances take place. Being in the Bab Makina, you can feel the history around you. The concert we saw was in two parts. 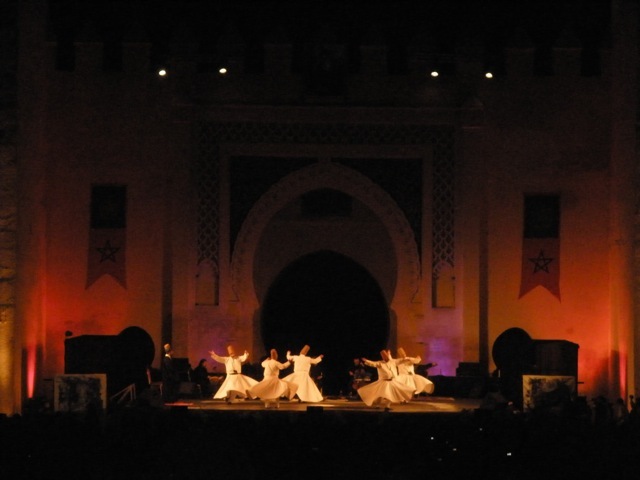 The first part were the traditional Sufi “Whirling Dervishes” from Turkey. A very traditional band opened with some beautiful music. Then the band provided music for the male dancers as they did their spinning routine. The music was haunting, and spiritual, and, partly due to the fact that I was so tired, and partly because of the style of music, I could not keep my eyes open, so I missed most of the dancer’s performance. The low-frequency chanting by the musicians however, definitely put me in a trance, and before I knew it, the first half was over. The second half of the performance was another take on the “Whirling Dervishes” concept and style, but with a seriously modern approach. This was Ziya Azazi and Serge Adam from Turkey and France. Serge Adam is a solo musician, on stage with just his trumpet, and a laptop computer (with a few MIDI controllers on the side as well). As soon as the music started, with Serge Adam playing his trumpet, and I heard what he was up to, I was instantly fully awake, and digging on the whole thing. As he was playing the trumpet he was recording into his computer, and instantly looping and manipulating the sound into incredible new directions, combining that live trumpet sound with some recorded drum sounds, and other strange sounds as well. He was manipulating the rhythm, and pitches of the music in real-time. My college major is Computer Music, and I spend many hours in my studio doing things similar to what Serge Adam was doing, and I found it incredibly inspiring and beautiful. 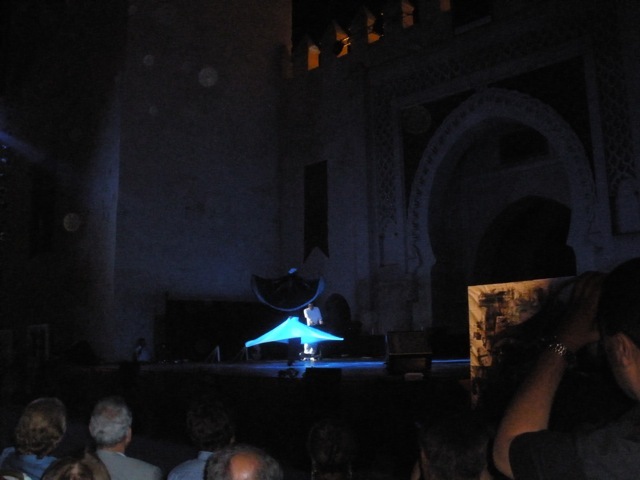 There were two dancers along with the music, and their spinning movements were a interesting juxtaposition to the traditional “Whirling Dervishes” we had seen in the first half of the show. This was a perfect opening to our Sacred Music Festival experience, and I enjoyed it so much. After the concert, we found the bus, and went back to our hotel to catch up on some sleep. This entry was posted by andy on Thursday, June 4th, 2009 at 2:09 am	and is filed under Preparation. You can follow any responses to this entry through the RSS 2.0 feed. You can leave a response, or trackback from your own site.